USE ON : acrylic, aircraft, appliances, aquariums, auto, banners, boats, bottles, chrome finish, cookware, countertops, fiberglass, foodlabels. furniture, glass, machinery and equipment, marble, metals - soft and hard, painted surfaces, plastics, skis, surfboards, tile, tools, vinyl, and just about anything else! A blade that won’t scratch? You bet! Now you can scrape to your heart’s content without worrying about scratching your work or cutting your fingers. Effective for scraping grease, gum, gunk’n’grit from any flat surface, including acrylic windows, metals, unfinished wood, decks you name it! Designed to fit most standard handheld blade holders. 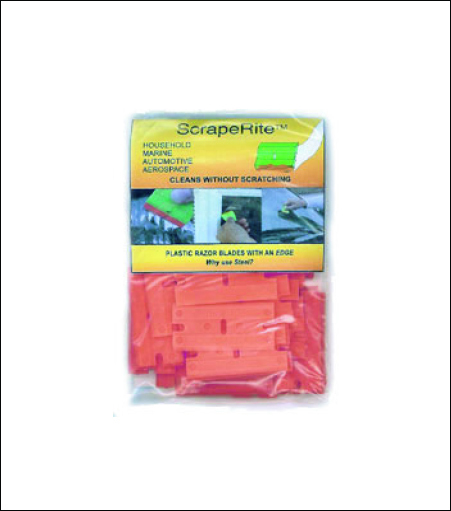 Package includes five double-sided, hard-acrylic blades (10 cutting edges) and plastic blade holder.